Japanese Knotweed (Polygonum cuspidatum) is one of our most prolific invasive plants, it spreads by producing copious winged seeds in the fall and through underground rhizomes. Colonies of knotweed advance and can puncture up through the pavement in the spring, making them especially hated by public works employees who will try to cut down the stalks and poison the heck out of the plant. 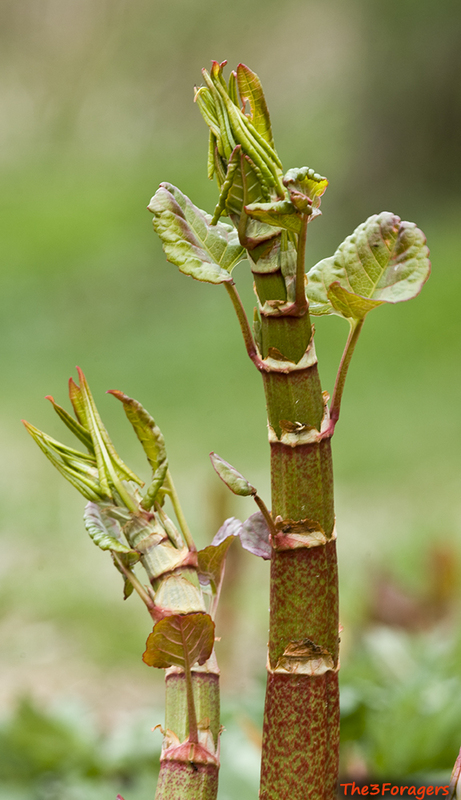 When gathering some knotweed shoots in the spring for consumption, try to get them from untreated areas and away from roadsides. They should also be picked before they are 12" tall; when they are still thick and have not unfurled too many leaves is the best time. 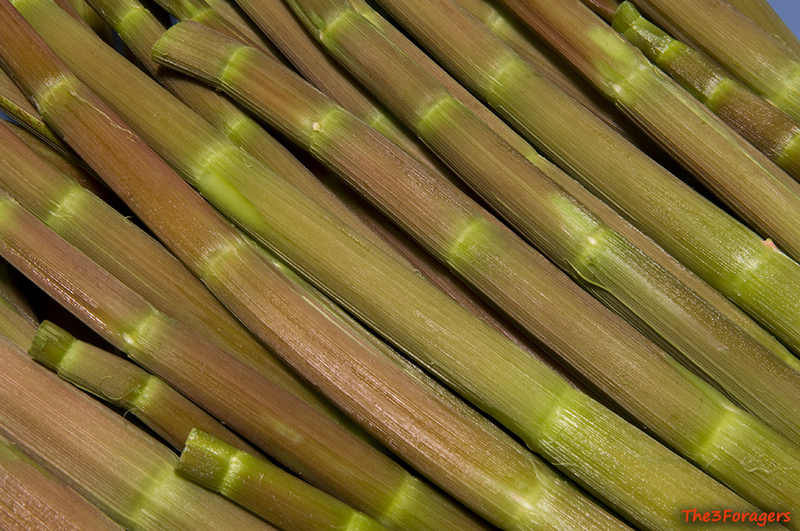 To eat them raw, we prefer to peel the stalks, which can be difficult since the stalk is hollow like bamboo. 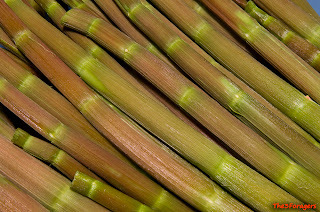 When they are younger, the stalks are thicker and the peel comes off rather easily with a knife or potato peeler. For this fruit leather recipe, you can use smaller unpeeled stalks, or peel the larger ones with a stringier skin. 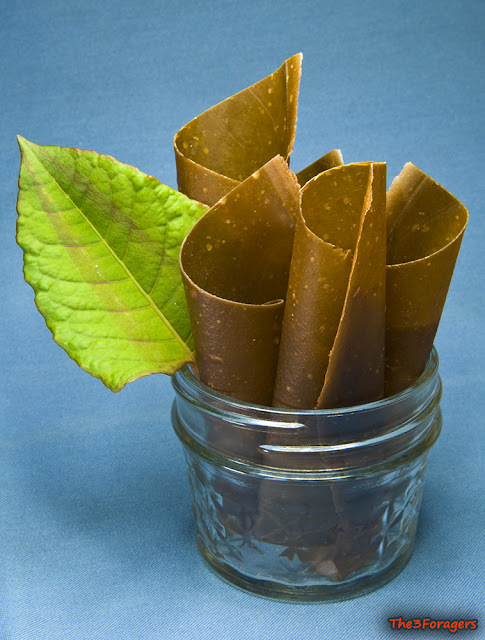 Since we purchased a better blender, we can make this fruit leather without the peeling step. The color is not particularly appetizing, olive green, but the flavor is similar to sour apples, without any of the knotweed's typical vegetal qualities. Our daughter, Gillian, really enjoys this snack and we had trouble keeping her away from the fruit leather long enough to take a picture. I tried two different methods of drying the fruit leather: the oven and the dehydrator. We have a cheap 1990's Ronco dehydrator that works just fine, using the fruit leather plastic tray. I then tried spreading the puree on parchment in the Ronco and it worked, but was a little more brittle. Then I spread some puree very thickly on some silicone baking mats on a sheetpan in the oven and it worked, but took the longest to dry. Once I removed it form the drying surface, I just rolled them up to store them in some glass jars. Update: We finally saved enough money to purchase a good Excalibur dehydrator. This recipe makes enough puree to fill 2-12" square trays lined with the silicone liners. I use the fruit leather setting, about 130º F until the leather has darkened and dried. The old Ronco still works too! This recipe is available in our book, available Spring 2016. There are other varieties of knotweed I found when looking up identification tips. It mentioned japanese as well as Bohemian, Giant and Himalayan. Do these varieties work as well or is it imperative that the ones used are of the Japanese variety? I am not sure about the other varieties of knotweed, we encounter Japanese knotweed and giant knotweed here in Connecticut, and both are very similar to one another. Harvested at the proper time (about 3.5-4' tall, Japanese knotweed makes an incredibly good handmade paper. 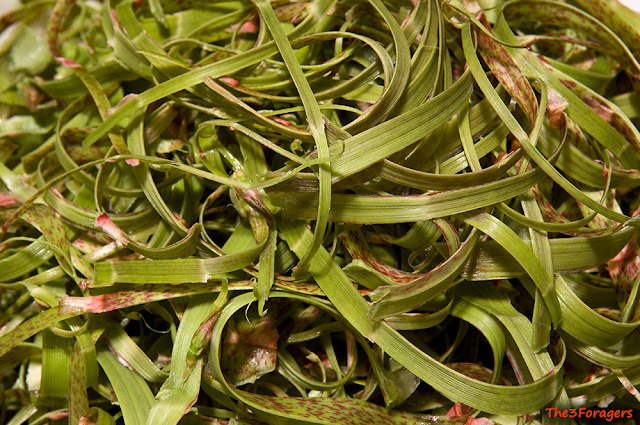 It's just a matter of chopping the stalks into 1" pieces, cooking for about an hour in sodium carbonate, rinsing, then running the mash through a kitchen blender or Hollander beater. The pulp is treated as any other paper pulp...suspended in water, pulled out on a screen and dried. It's a wonderful use for a nasty, invasive plant. Nice post.. Thanks for sharing information about knotweed..
Japanese knotweed is a terrible terrible problem where I live. It is so invasive, and has no enemies, that the dept of Agriculture and all concerned attack it by injecting it with herbicide. That's the only thing that does away with it. I'm not surprised one can make paper out it! Hello, and thanks for the great article. Are taller stalks edible, if you are going to remove the leaves and boil them? I would like to make something with japanese knotweed now, but leaves are already unfurled and stalks about 2 ft tall. The taller the knotweed grows, the tougher it gets. You can still gather some and peel it, but the peel thickens a lot as it gets taller, so peeling it will leave you with not so much flesh and a lot of the hollow "hole". For jelly this is not so much an issue, since it is boiled and strained, but when you are trying to use the whole stalk for something, the smaller it is, the better. Thanks very much for answering, that is helpful. This is all incredibly interesting and we are keen to try; we agree 100% - eat the invasives! We are wondering though - have you any nutritional information on Japanese Knotweed? We appreciate your time and your site. Can I Eat Those Onions in My Yard?